From the towel clad patrons of NYC Bathhouses to distinguished opening night Broadway crowds, the divine Bette Midler has entertained them all. Nicely, she has also noticeably charmed a generation of queer terror lovers with her hysterical take on witchery in the beloved horror comedy Hocus Pocus. Thankfully, Midler also worked some of that dark magic with her take on My Eye On You. This mysteriously possessive tune is a highlight of No Frills, her enjoyable album of rock and New Wave numbers. A deadly journey in less than 4 minutes, this number proves why Midler always has us risking our lives by coming back for more. Witchcraft Series: The Final Adventure? Some folks dip their toes in the pool. Others dive in, body first. Derrick Carey of the sick cinematic podcast Astro Radio Z belongs to the latter category. He and various other mutants, myself included, have been immersing themselves in the deep end by analyzing the low budget soft core horror series Witchcraft – for…gulp…years now! Naturally, now that Witchcraft 14: Angel of Death, Witchcraft 15: Blood Rose and Witchcraft 16: Hollywood Coven have been unleashed upon the world, we had to take a look and give our (sometimes) zany, (occasionally) well modulated opinions on them. Nicely, we are joined here by Dustin Hubbard, an accomplished filmmaker and, perhaps, the greatest Witchcraft fan ever. The second issue of the Chilling Adventures of Sabrina, the new comic that puts the beloved golden haired Archie denizen in a spooky 60s setting, briefly features Ann-Margret as one of the teen’s show biz muses and a fellow enchantress in mystical arts. This should come as no surprise to the faithful whom have always found Ann-Margret simply bewitching. Even when expressing heartbreak, this saucy wonder, whose genre credits include Magic (with Anthony Hopkins) and 2006’s Memory, always sounds as if it won’t be long before she’ll be turning the tables on her target. Don’t believe me? Check out her 1961 hit I Just Don’t Understand. Later covered by The Beatles, this number was one of the first to feature the fuzz-tone guitar and contains a purring, totally seductive and completely in control performance from our lady of the hour! 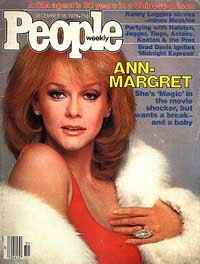 Be sure to check out http://www.ann-margret.com, as well.